Enterprises are increasingly adopting container runtimes and Kubernetes distributions, with stateful use cases. Infrastructure and operations leaders need to map their use cases and deployments preferences, and provide a decision framework for planning and enabling infrastructure delivery. The growing adoption of Kubernetes is having a significant impact on the container ecosystem, how it interacts with storage infrastructure and the ways applications are being designed. In the past, containers were primarily deployed for stateless use cases; however, adoption in a wide range of stateful use cases is growing, as shown by the popularity of stateful apps in public cloud repositories. After a series of failures in the container-focused storage ecosystem, hope is increasing for standardization through the introduction of the Container Storage Interface, which is being promoted by the Cloud Native Computing Foundation. 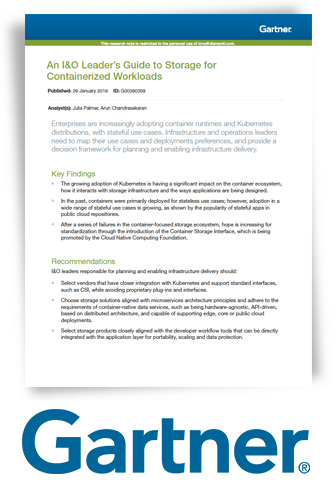 Download now to get container storage best practices from the experts at Gartner. Gartner, An I&O Leader’s Guide to Storage for Containerized Workloads, Julia Palmer, Arun Chandrasekaran, 29 January 2019.